Are You Ready to Submit Your Performance Review? Wait, read these 3 tips and prepare yourself well before you do that! You are ready to submit your performance review to your manager or into the system... You have worked hard at giving your inputs. You know what you want to get out from the review, you understand your company system, and have collected good performance related data throughout the year which you have written up. What do you need to do before you submit your performance review? What should you say and what questions should you ask? Think about what you want to say as you hand over your performance appraisal or review form. This is important and will help you position yourself in any way you want for the actual performance review discussion. Also remember that your manager may have to do a few things before the actual discussion. These may include providing their comment, assessing your performance against the objectives and giving a performance rating. Depending on the performance system in your company there may also be other activities such as comparing your performance against others to arrive at a rating, forced ranking and in some cases deciding on compensation such as pay increases. After you submit your performance review your manager may also go and seek feedback from your customers, colleagues, subordinates and other managers as additional data on which to base your performance and give you feedback during the review. Given that these things may happen from the point you submit your performance review document to the actual discussion it is worthwhile reflecting on how you position yourself prior to the review. How you want to position yourself is also closely tied to what you wanted to get out of the review in the first place. Go over it and reflect in your mind and then think about what to say and how to say it. Here are some thought starters on what to say and give as you submit your performance review. On what you have written up - "I have included all my major achievements throughout the year and completed all the sections. I have already reviewed it but would appreciate if you could please take a look at it and let me know what you think and if I have missed anything important." This way, you are telling your boss that you have done a good job in completing the form but you are still open to any suggestions that may make your review or appraisal paper even better. Customer feedback - "I have included important customer feedback in my review which may give you further insight into what my customers are saying about me. I welcome your comments and if you have any specific feedback from my customers that I may have missed then please let me know." You have now given your boss the feedback others have about you and also provided some further opportunities to get additional data. This is also another way of indicating to your boss that you are after real world data and feedback rather than just what your boss thinks. This is particularly important if you have a boss that has a narrow or incorrect perception of your performance and you need to correct that situation. 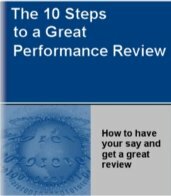 About your rating - if you are expecting a superior rating, have made your boss aware of your intention, and have been working towards this right from the start of the year then it does not hurt to gently remind that as you submit your performance review. This is a great way to position yourself and indicate to your manager that you are still after that rating that you had set your sights on at the start of the year. Performance feedback - good managers always provide very specific feedback. Poor managers do not give specific feedback, talk in general terms and sometimes even blame others for the low or unexpected rating you may be getting at the end of the year. If you are afraid of such a situation then make it clear to your manager that you would like to receive very specific feedback about your performance during the actual discussion. You will be sending a very clear signal to your manager that they need to do some thorough preparation prior to the review. Additional data - if you have done a good job at collecting your performance related data throughout the year then you should by now have a good collection of these facts and figures. It is not possible to include all of them in the review paper but you may consider preparing an attachment or a separate document containing such information which you provide as you submit your performance review. This way you are giving your manager a lot more information that they can use and refer to as they get prepared for the performance review discussion and give you real and specific feedback. By doing a lot of work for your manager and feeding them the information you are making their job much easier which should result in a successful performance review discussion. If this seems like a lot of work on your part then think again. You only get one chance a year so make the most of it! Once you done this it is best to ask some open ended questions which will help flesh out any concerns or issues that may be in your manager's mind. Sometimes your manager may not be all that forthcoming but it is still worth a try. As you submit your performance review you can ask if they have any questions or concerns with the information you have provided. You can also ask if they need anything else prior to having the discussion. Tell them that you are looking forward to having a very productive performance discussion and if they can think of anything else they need prior to the discussion or that you need to prepare then they should let you know. You can also tell them that they can borrow your book on writing effective phrases for performance appraisals which will also help them give you a better quality input in your review. Finally, if appropriate, agree on a date and time when you will have the performance review discussion and prepare well for it. This level of preparation will pay off as you get ready to submit your performance review. Previous - how to write up your review. Next - get ready for the discussion.